Colombian artisans used leaves from a palm tree indigenous to South America to create a bracelet that both your fashionista and eco-minded friends will covet. One day I received a call from a woman who said she had visited the VirtuArte website and thought her line of jewelry made from sustainable materials would be a wonderful addition to the VirtuArte collection. As I am always looking for new artists and new products I agreed to meet with her. Lorena Gaitan brought her beautiful Colombian jewelry collection to our first meeting and I couldn't keep my hands off the wide array of vegetable ivory, bull horn and cana flecha necklaces, bracelets and earrings. Elbeto was started by Lorena to promote the growth and development of emerging designers in her country of origin, Colombia. 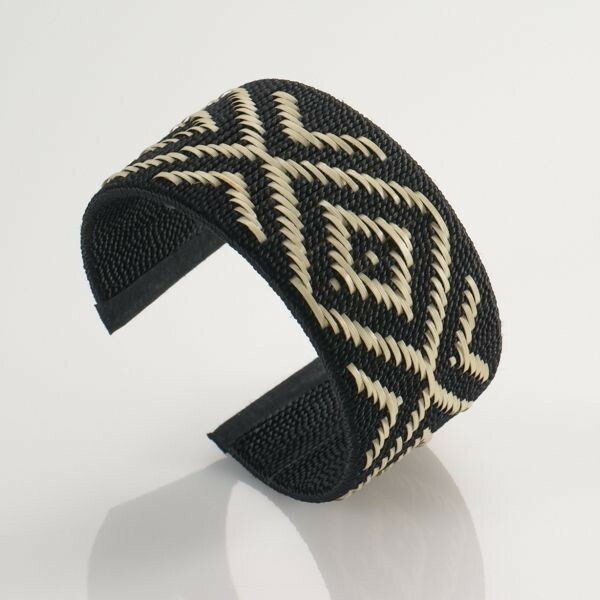 Cana flecha, the material used to create this bracelet, is a type of palm, indigenous to South America, that grows without fertilizers and dried in the sun. The strips of palm are hand-woven by artisans using pre-Colombian techniques to create jewelry, hats, handbags and other fashion accessories. Elbeto works to preserve traditional craftsmanship while creating fashion forward accessories for VirtuArte customers.